Shown with optional bit extender holder. 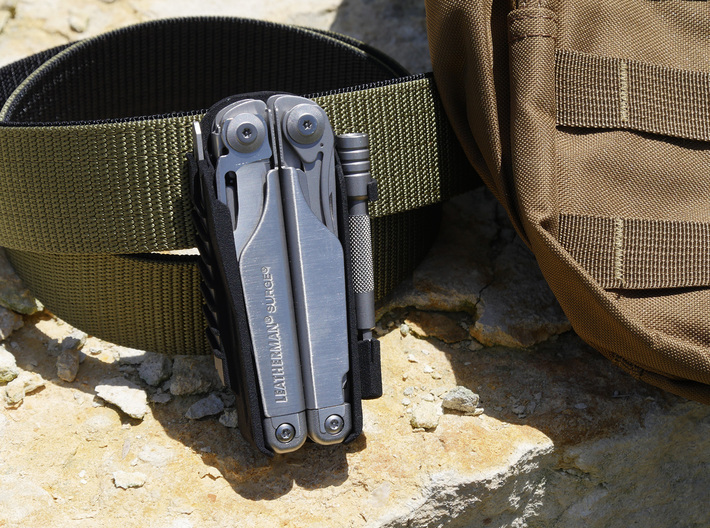 This holster is designed to fit the Leatherman Surge Multitool. 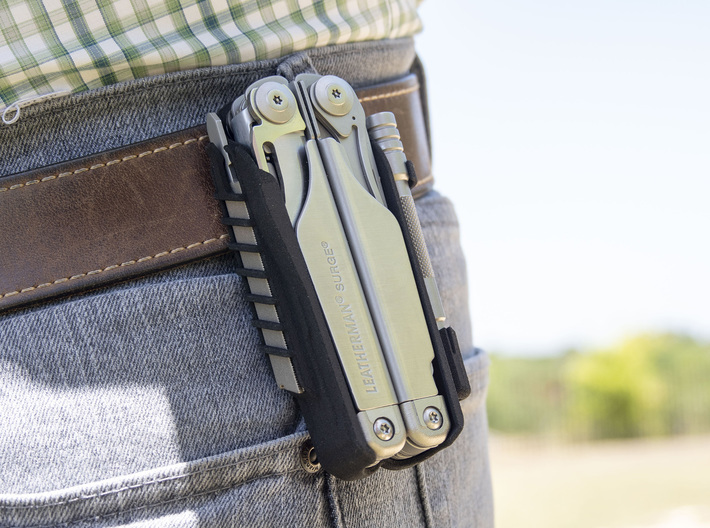 If you want a holster for other Leatherman Tools, click here. Select "Small" for: 48x4.6mm (1.89x0.18in) belt opening. Select "Large" for: 47x7mm (1.85x0.27in) belt opening. Avaiable as a drop holster, with or without bit extender. Attaches to PALS webbing. MOLLE Compatible. 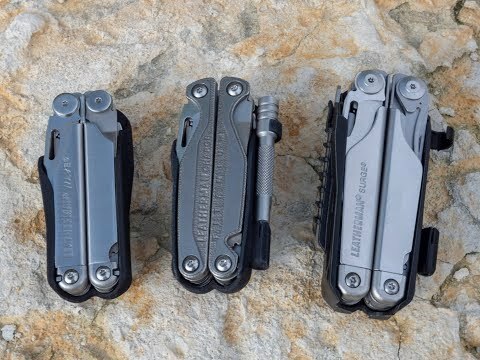 Seven leatherman bit holders built in. Built in spare file/saw blade holder. Keyhole feature allows it to be hung on a nail or hook. 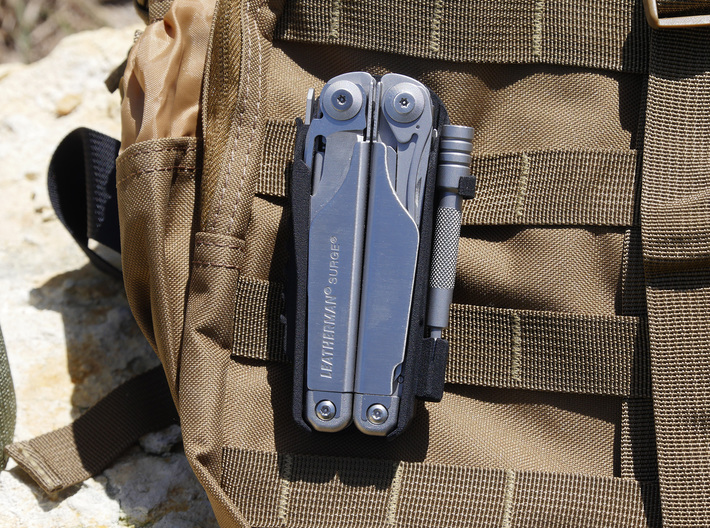 The tool is is held in place using the two spring-loaded release buttons built into the multitool. A channel down the center allows you to remove the tool using just one hand. Symetrically allows for left or right hand attachment. Designed due to popular demand. I ordered the Surge, knowing that its larger size, and almost recessed spring tabs would pose a challange. However, due to multiple prototypes and accurate modeling I have a holster which fits perfectly, and hold securely. I was supprised to find that the Surge has a seperate file and saw blade. And that they expect you to haul the spare blade around in a little vinyl pouch. 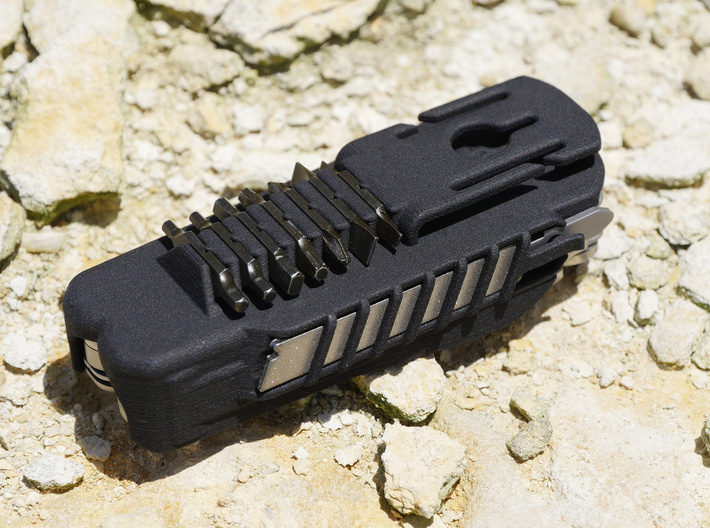 No more, the holster has a built-in blade holder with a catch to secure the blade. Simply lift the catch to remove the blade. 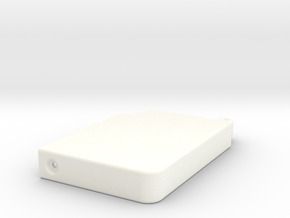 This version was designed from scratch using professional CAD software. It form fits around the tool with no added bulk. 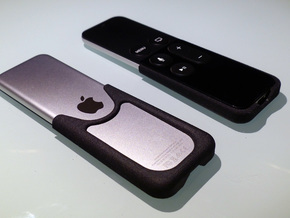 The tool slides in with ease, but won't fall out on its own. It can be easily removed with one hand. Made from highly flexible yet strong nylon. It will hold up to daily use. Water proof and heat resistant. 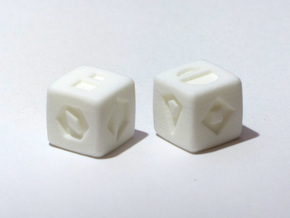 Shapeways handles the part production and shipping based on your order input I (ZapWizard) am the part designer, and I receive a portion of the total order. I cannot customize, alter or process any returns after your order has been placed. 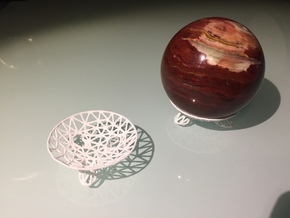 All post-sales issues must be handled through Shapeways customer service. Leaving any text in the "Personal Message" box will be printed on a gift card included with your shipment, I do not see these messages. If you want any modifcations to your holster, please send me a message through the Shapeways interface.